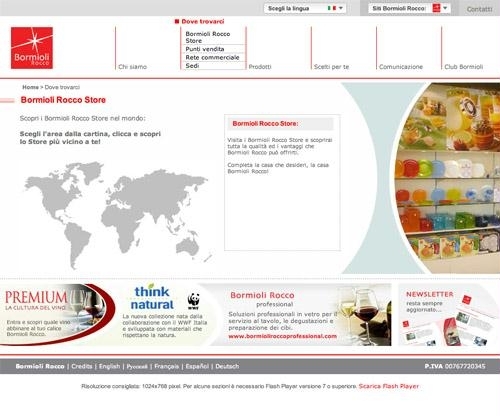 Since its first glass factory opened in 1825, Bormioli Rocco has become over time a group recognized worldwide as a leading manufacturer of glass products, as well as packaging for the pharmaceutical, cosmetic and food industries. The Company needed a tool that would aid contact between the business and users and that could serve the different websites dedicated to the main divisions of the group: Home, Professional and Plastics. n addition to dealing with conversational marketing, Layoutweb used different software it designed itself for Bormioli Rocco, such as Laymessage for website lead management and LayJob for the collection and administration of curricula, also from the website. ogether with Layoutweb the company was also able to make use of other online communication tools, such as the Pay per Click Campaigns, PR and the sending of newsletters for branding and customer retention activities. Bormioli Rocco has established its visibility thanks to its presence in hundreds of international directories; it has seen the publication of press releases and news on the most important sector websites and the greatest general portals. The large number of newsletter subscribers has enabled the communication of periodical and targeted updates.